If you’ve been holding off purchasing your domains and web hosting service because you’re waiting for the Black Friday deals to kick in, we’ve got good news for you: Bluehost Black Friday 2018 Deals just dropped and you’re looking savings of up to 50% on selected services! * unlimited hosting from $2.65! Bluehost is offering up to 50% off selected domains! If you’re in the market for a new domain name, now’s as good a time as many, seeing you’ll be getting your domain at half of the original price. You’ll also get to enjoy shared web hosting with rates as low as $2.65 per month, top of the line web hosting. With savings like these, you can afford to get as many domains as you want. If I were you, I’d buy domain names for whatever business ideas I might have, just cause it’s so affordable on Black Friday and you never know when you might want to start a website for a particular business! Actually, we should all just buy a bunch of domain names just to keep. It might prove valuable in the future if someone wants to buy that domain from us! Black Friday traditionally happens the day after Thanksgiving, and it signals the start of the Christmas shopping season. As stores throughout America slash prices for 24 hours only, shoppers will flock to the shops in hopes of getting a good bargain on items they want for themselves, or gifts for loved ones and family. Bluehost was created in 1996 by founder Matt Heaton. It was acquired by the Endurance International Group, and currently remains as one of the top 20 web hosting providers in the world. They’ve currently got over 2 million websites under their web hosting portfolio, and has won several awards for their stellar service. We’ve done some server speed tests with Bluehost and we are quite happy with their performance, which is impressively ranked A (one of the fastest speeds in our ranking table). Check out our Bluehost review over here if you wanna know more! Bluehost is officially recommended by WordPress.org. On top of that, Bluehost actually has plenty of desirable features! Take, for example, unlimited web hosting. We’re talking unlimited bandwidth, storage, & email accounts. Who wouldn’t want that? They’ve also got free SSH and Ruby-on-Rails support, with (get this) FREE DOMAINS. Granted, you only get the domain name for free for the first 3 years, but you’re still saving a bit of money, considering common domain extensions like .com or .org can be quite costly. 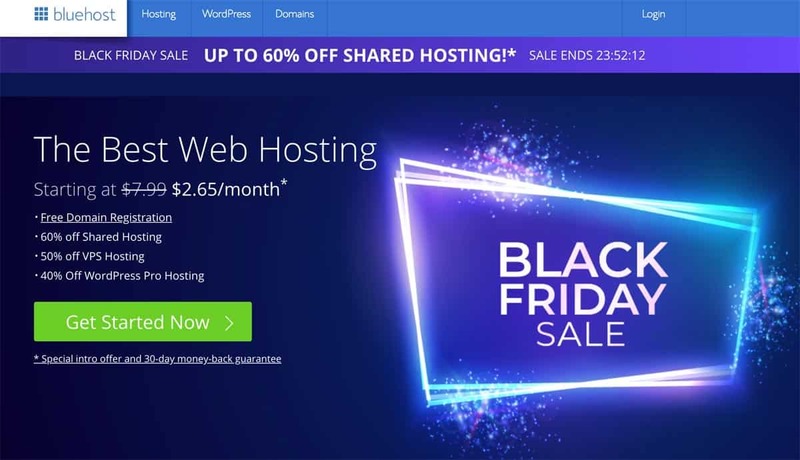 Pair those features with a top-tier 24/7 US-based support and you’ve got one of the better web hosting services around, at a crazy Black Friday price point.